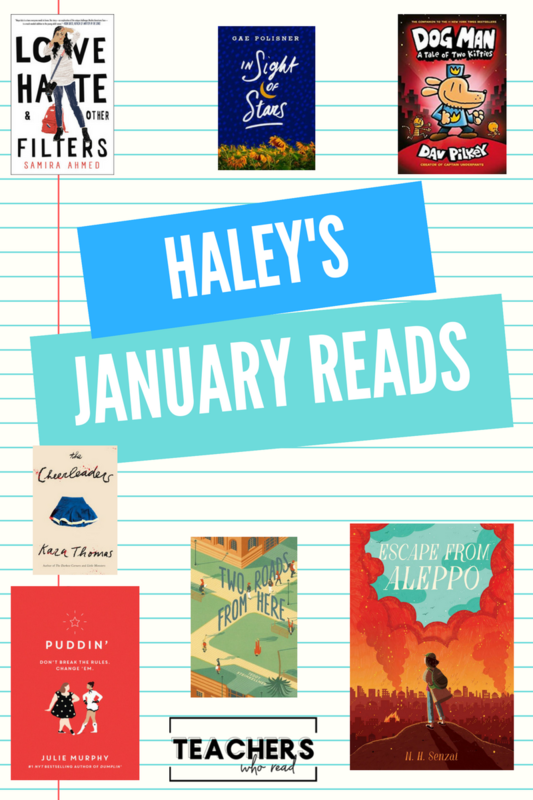 I spent January reading books that I'd been wanting to read but just hadn't gotten to yet. And, boy these books didn't disappoint! Love, Hate, & Other Filters is an #ownvoices novel that cleverly weaves together two stories. Maya, an Indian girl in a nearly all-white school, and a terrorist plotting an attack in Maya's town. In Sight of Stars isn't out until March, but go ahead and pre-order this one now! A little bit Challenger Deep and a little bit All the Bright Places, Polisner's book puts mental health in the forefront as Klee (pronounced Clay), struggles with his emotions after his father dies. My 7-year-old read Dog Man: A Tale of Two Kitties aloud to me. In this book, Dog Man has a new nemesis-Petey the Cat's new partner. My son loved the story, and I loved the Dickenson allusions on nearly every page! Another yet-to-be-released book I finished this month was Puddin, by Julie Murphy. I adored Dumplin', and this follow-up did not disappoint. Characters from Dumplin', Callie and Millie are back, but this time we learn more about them. Two Roads from Here is an interesting concept-written like those Choose Your Own Adventure books from the early 90s. At the center of this book are 5 seniors, who must each make a life-altering decision. Each character has two potential outcomes, and you get to read about both! Kara Thomas is a master of disturbing plot lines. Her books are never on my shelves, and for good reason. Five cheerleaders are dead and Monica, the sister of one of the deceased can't accept that their deaths were mere accidents. The Cheerleaders doesn't come out until July, but when it does, carve out a day to finish this in one sitting! When Nadia's home in Syria is destroyed in a bombing raid, she is left behind. With the help of an egregious old man and a few friends she meets along the way, Nadia does everything she can to Escape from Aleppo even though it has always been her home.